It had been some time since I had taken the drive out to Muriwai on the west coast of Auckland, one day in November a friend visiting Auckland for an ecology conference was just the excuse I needed. Too good a chance to miss showing her the Gannet Colony and one of Auckland’s wild west coast beaches. It is one of my favourite day trips from Auckland, often including a visit to an east coast beach on the same day to see the amazing contrast. 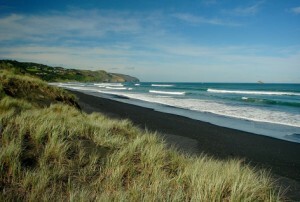 Muriwai is 45 minute drive from Central Auckland – just 10 Minutes from the end of the North Western Motorway. The west coast is known for its wild and windy weather and this day was no exception – the waves were whipped up into a frenzy, the white clouds passed rapidly and thousands of gannets and white fronted terns were wheeling riding the currents. The white guano is everywhere as the birds add this rich fertilizer to the soil they are nesting in. 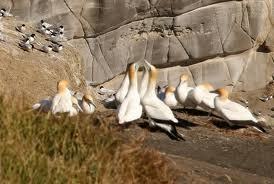 Muriwai is one of the few places where gannets nest on the mainland, and a well formed pathway takes you up on the cliffs between Maukatia (Maori Bay) and Muriwai beach to see them. Its nesting season so space is at a premium – their backs to the wind, they struggle to stay in place. There is a clear space requirement for gannets – they all seem to be equi distant from each other, apart from the pairs who snuggle up together displaying their distinctive beak kissing displays. Nearby White fronted terns seek a slightly different environment – more sheltered and still some vegetation about.